Part of me wants to soar, to expand, to fly. I want to go places, see things, experience adventures. I want to stretch who I am and become what I am not. I’d like to paint pictures of great beauty and understanding – story pictures that draw the looker into my world. Alas, this dream is impossible. I’d like to make music that touches hearts - singing sad and happy songs - changing listeners’ feelings with music. I’d like to play the songs on an instrument that makes them feel what I feel. This dream is not likely. I want to write words that take people where they have not been – words that stir emotions in my readers. I want readers to see what I’ve seen, hear what I’ve heard, and feel what I’ve felt. I’d like for my words to make people laugh and cry and think. This dream I believe to be possible. This is the butterfly soaring away from the safe world. Another part of me wants to be safe, follow rules, and avoid risks. This part does not venture out because of fear. Fear of the unknown, fear of failure, fear of ridicule. This is the chain and the rock. Its chain keeps the butterfly from soaring too far away. When I was 13 and 14, there was no butterfly, just the rock and chain. How long it has taken for the butterfly to emerge from the cocoon! Slowly, the chain has weakened and lengthened. Sometimes pressure was strong to stretch the chain. Sometimes rough winds blew and scared the butterfly back to the rock. Today the butterfly goes farther and stays longer. It takes a chance now in sharing this with you. You may be the ridiculer. Yet the risk feels good. Maybe someone will see beauty in the butterfly. I’m glad for the butterfly, glad it came out of the cocoon. I’m even glad for the rock. The rock keeps the butterfly in check so it doesn’t go so far into the storm that it is destroyed. Who am I? I’m a butterfly chained to a rock. Originally, this piece was a shared exercise with the members of one of my favorite writers’ groups – the gifted language arts students I taught in Louisiana at Leesville Junior High School. We writers chose our own images and then wrote an essay about how that image reflected who we are. Retired from teaching, I find this image still defines my writing career. 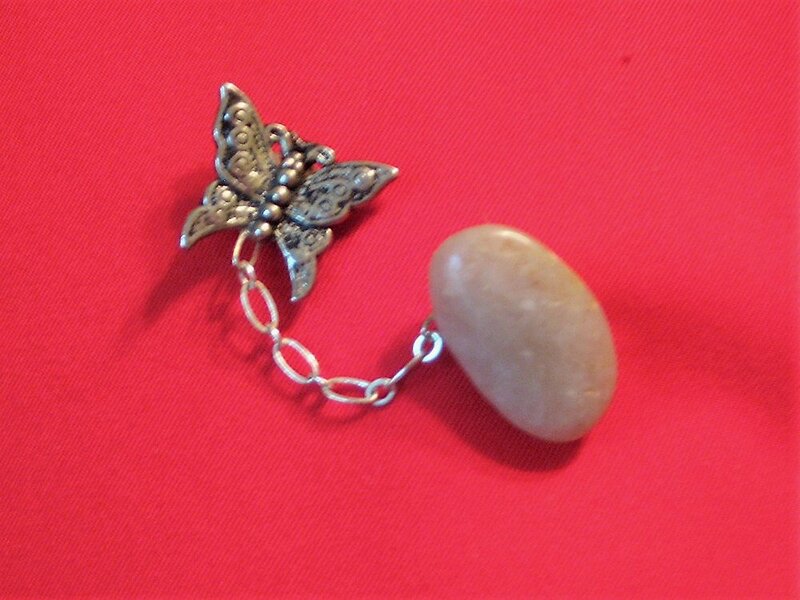 The chain and rock keep me double-checking and rewriting until the butterfly demands a chance to go out into the world. Not so fragile any more, the butterfly returns to the rock after encountering harsh winds of rejection to rest and demand a fresh rewrite. And sometimes the butterfly gets an acceptance that brings a day in the sun to spread her wings and frolic among the flowers.